What is it about the crisp fall air that makes people want to bust out some serious crafts? Does this happen to you? Maybe it’s that back-to-school motivation mentality, or maybe it’s just cold and we want to stay indoors. Who knows? Whatever the reason, fall is prime crafting season. But you don’t need a craft closet (who has one of those?) or a ton of fancy, expensive supplies in order to help kids get their craft on. 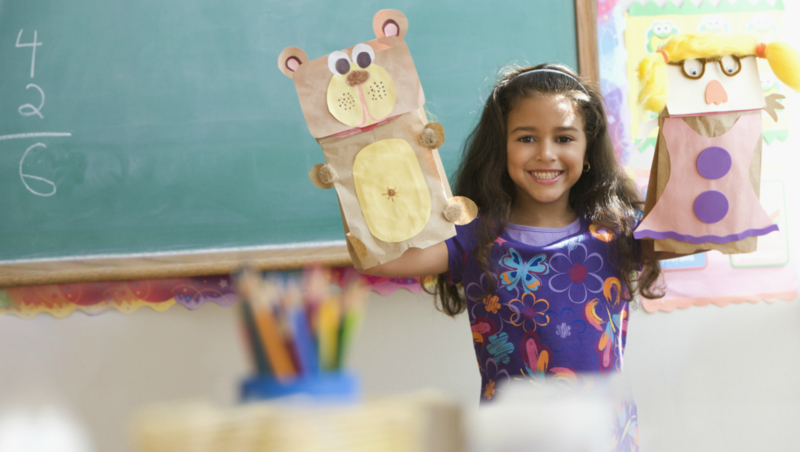 The paper crafts below are cheap and easy and will keep your kids busy for hours. Win-win-win. Cut the paper bag open along the side of the bag, then cut out 4 strips that are 3 inches wide and are as long as the paper bag. Tightly twist each of the 4 strips. Gather the 4 strips together in a bundle and twist the bottom half of the strips together to form the tree trunk. Glue the tree trunk to the construction paper. Bend the loose ends of the strips to form the tree branches and glue them in place. Cut 1-inch squares out of the red, orange and yellow tissue paper. 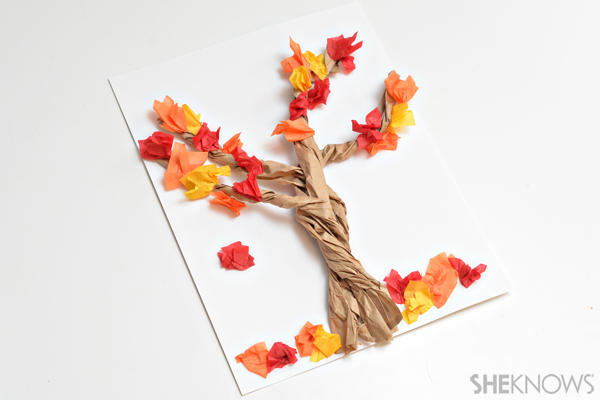 Scrunch the tissue paper squares into a ball and glue them on the tree branches to make leaves. Glue a few extra tissue paper squares to the bottom of the construction paper. Lay the paper bag out flat on the table, with the folded bottom flap facing up. Cut an oval out of the piece of burlap and glue it to the center of the paper bag. 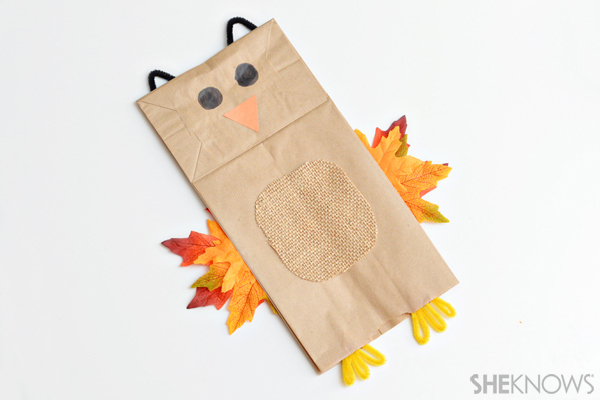 Gather some fall leaves and glue them to both sides of the paper bag to make wings. Cut a yellow pipe cleaner in half. Fold each half 3 times to make the owl’s feet, and glue the feet to the bottom of the bag. Cut a small triangle out of the orange construction paper and glue it upside down to the bottom flap of the bag. Draw 2 circles above the triangle to make the eyes. Cut 2 pieces of black pipe cleaner that are 3 inches long. Fold them loosely in half so that they form a triangle shape. Glue them along the edge of the bottom flap. Once the glue has dried, the paper bag puppet is ready to use! Fill the paper bag 2/3 of the way full with plastic bags. Twist the top of the bag closed. 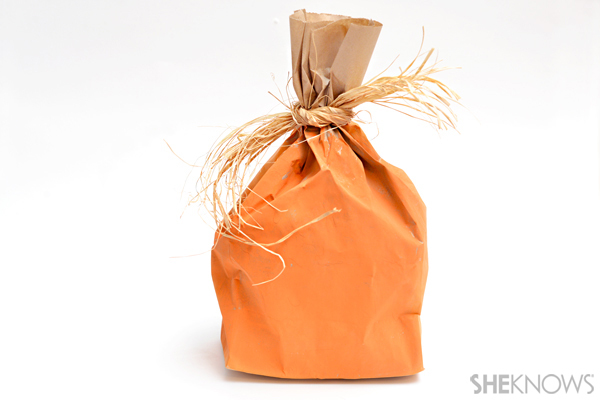 Paint the bag below the twist with the orange paint and allow the paint to dry. Once the paint is dry, cut a 12-inch bundle of raffia and tie it around the twisted part of the bag. 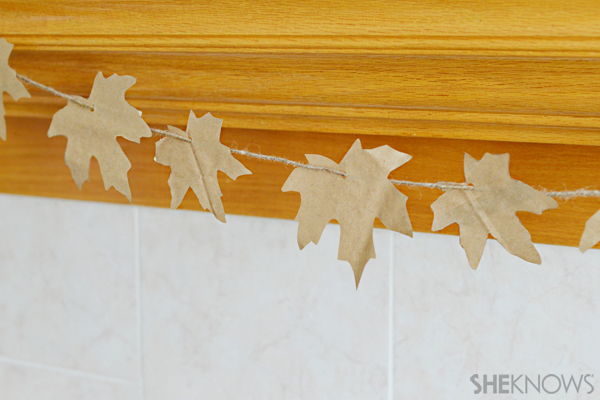 Gather some fall leaves and trace around the leaves on the paper bag with a pencil. Cut out the leaf shapes. You will need at least a dozen leaf shapes or more, depending on the length of your garland. Use the hole punch to punch a hole in each paper leaf. Cut a long piece of twine and feed the leaves on the twine. Originally posted September 2013. Updated October 2017.